The New Media Studio helps the campus community apply emerging media technologies in teaching, learning and creative endeavors. The Studio supports academic, research and faculty development activities through its staffing and facilities. These include a multimedia production lab, field production units and a television soundstage. 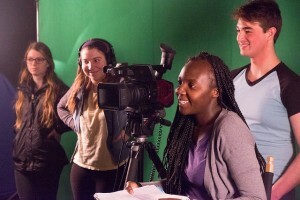 MCS Production Fellows work on Refugee Youth Project documentary in UMBC TV studio. We work closely with campus and external clients to produce custom media solutions for the web, multimedia and video. Information on our production services is here.